The addition of barcodes can give your tickets a more professional, ‘high tech’ and secure appearance, whether you use them or not. 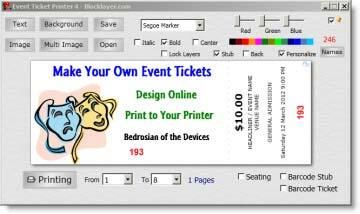 If you have a basic USB Barcode scanner, you can use this free Barcode Processing Application to process admission tickets at your event entry. As for Security, barcodes can only prevent multiple entry via copied tickets. Once scanned and recorded on entry, ticket barcodes cannot be re-used. In a situation where a second ticket is presented with an identical barcode/number, the ‘first in’ is still in, no matter which is the authentic ticket! In a situation where you suspect a ticket has been copied, probably your best bet is to closely inspect the perforation you made (with the sewing machine) Anything printed can be easily copied, but the physical perforation you made should be visible in the copy, and difficult to exactly match. For more robust copy protection, a unique physical (indentation) mark on the tickets may prove more effective. There are many more, expensive options also. To add (Code 39) Barcodes, check Barcodes The stub body textbox will be resized and barcodes added above the Stub Number. If using a Seating Plan (with seating prefixes), you can save a text file with all the Barcode codes. Seating Plan Barcodes will include the alphanumeric prefix and the seat number, separated by a hyphen, eg: F-10. 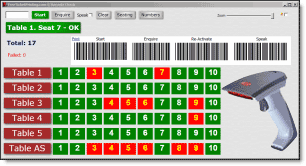 Ensure your Seating Plan layout contains unique barcode codes by viewing (and saving) the codes. Click Show All Codes to inspect the code layout.